Another excellent event at Arkaoda this month with some of Alien Transistors finest taking to the stage. Here’s something unexpected and wonderful. The return of Takuji Aoyagi aka Kama Aina with the inevitable Munich Japanese support team – the Acher brothers and various Notwist cohorts. It’s a great collaboration – mesmerising, melodic, in the moment. Somewhere between The Notwist theatre masterpiece, The Messier Objects and Kama Aina’s Music Activist is a special place which this righteous gang have made their own. As listeners it’s our pleasure to join them there for a while, us citizens of nowhere belonging to music rather than national boundaries. It’s a blissed out autumn sun, it envelopes, it encloses, it’s pretty amazing. 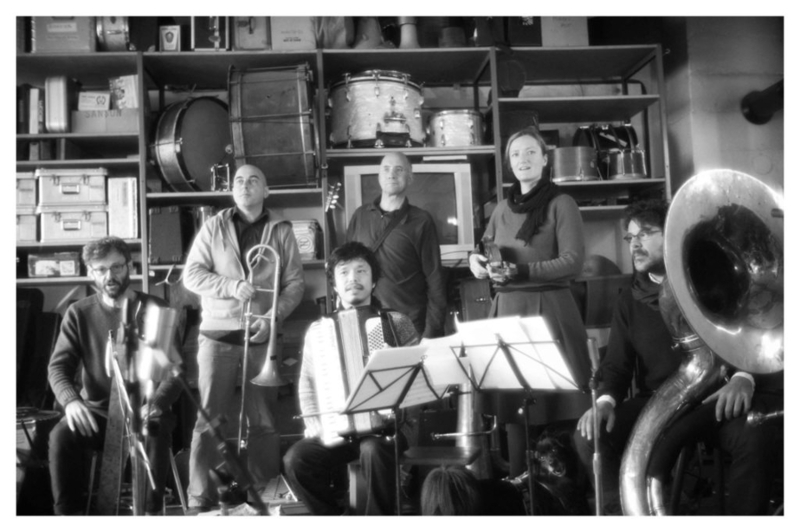 Hochzeitskapelle – familiar names like Markus and Micha Acher, Mathias Götz, Alex Haas, and Evi Keglmaier – are experienced sonic explorers, known via various outlets and constellations, including The Notwist, Le Millipede, Unsere Lieblinge or Mrs. Zwirbl. As Hochzeitskapelle, they usually focus on cover songs, playing their loose-limbed, rumbling, foolhardy jazz tunes mostly live, in bars, in parks, out in the streets. One of Hochzeitskapelle’s go-to cover tunes has always been Kama Aina’s “Wedding Song”. An “incredibly beautiful song,” according to Markus Acher, a truly magic tune. Well, at some point they wanted more of the wizardry, and so they asked Kama Aina to write more magical tunes for the group. The result of this approach is Hochzeitskapelle’s new album, “Wayfaring Suite”. Midori Hirano speaks of “waning lights” and “edges blending into fog” as some of the sensory indicators inspiring Mirrors In Mirrors – her debut on Daisart – and these Impressionistic sentiments are deeply imbued within Hirano’s delicate, restrained compositions. The hallmarks of modern classical, electronica and ambient are adopted as an assemblage to explore nuanced tones and techniques less dictated by those stylistic underpinnings, perhaps somewhere hovering between – but never too far away – keenly aware of form and function.